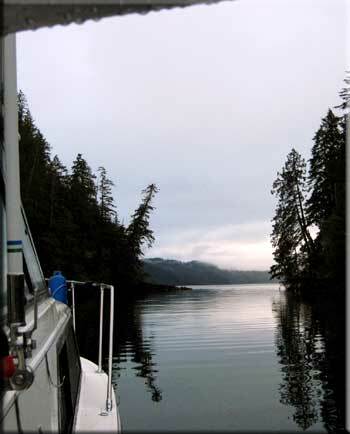 Poett Nook off Barkley Sound. 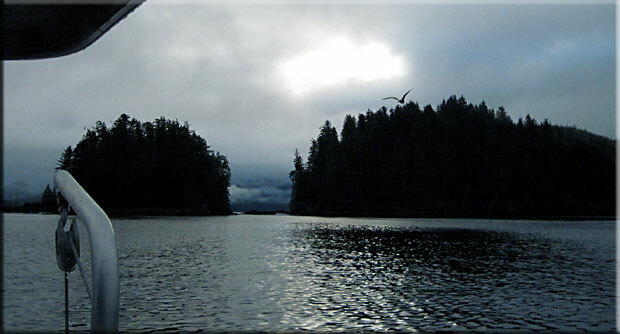 About one third the way up the west coast of Vancouver Island, Barkley Sound forms a large bay, approximately thirty miles across and twenty miles deep. This exquisite sound harbors a great number of islands, including the Broken Island group. The islands and surrounding terrain are heavily wooded; the sound itself is home to a rich diversity of wildlife. 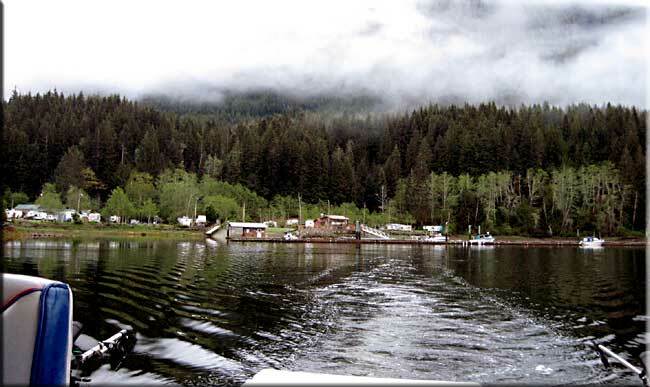 Just inside the southern face of Barkley Sound is the small community of Bamfield. 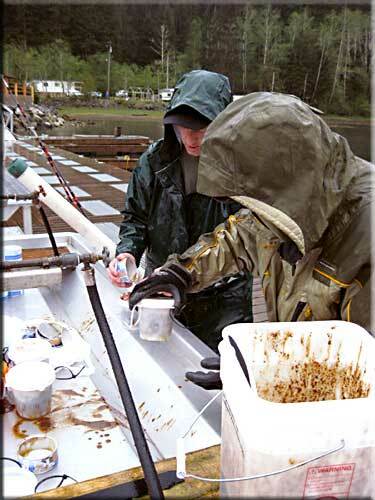 This community is either reached by boat, or by a 45 mile gravel road from Port Alberni. 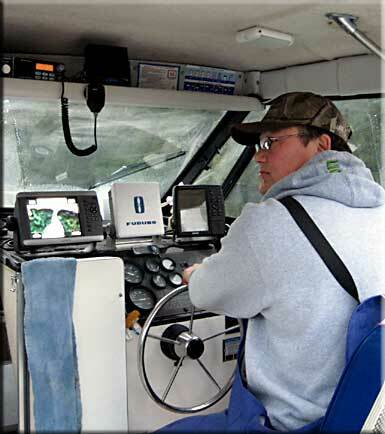 I received and impromptu invitation to join a college classmate, Ralph, his nephew, Alex, and three others, Doug, Doug and Kiko for a fishing trip to Barkley Sound. 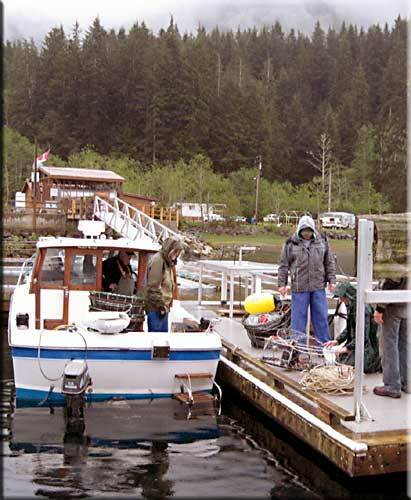 As we waited for the BC Ferry, which would take us to Nanaimo, Vancouver Island, I learned that we would be going to Bamfield, or more accurately, Poett Nook, a fishing camp about ten miles prior to Bamfield. The Dougs, whom we soon called Doug senior and Doug junior, each had a boat already waiting at Poett Nook. The BC Ferry to Nanaimo was large and comfortable with a more than adequate cafeteria. The two hour crossing gave us time to eat, and to get to know one another a bit. We got to Nanaimo at about 3:00 PM, and drove for 1 1/2 hours to Port Alberni, where we got our fishing licenses, filled up gas cans for the boats and did our last bit of shopping. 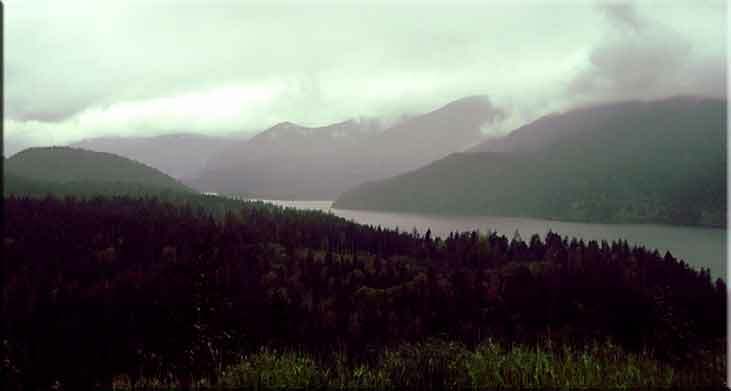 It was then a 35 mile drive on the gravel road down the south side of the Alberni Inlet, a long fjord which runs from Barkley Sound across two thirds of Vancouver Island. The gravel road was in very good condition and we made the distance in just over an hour. A steady rain set in, which kept down the dust, but coated the trucks with a suitable coating of mud. When we emerged from the thick woods into Poett Nook, I saw a tranquil bay, about 1/4 mile in diameter, shaped like a key-hole. 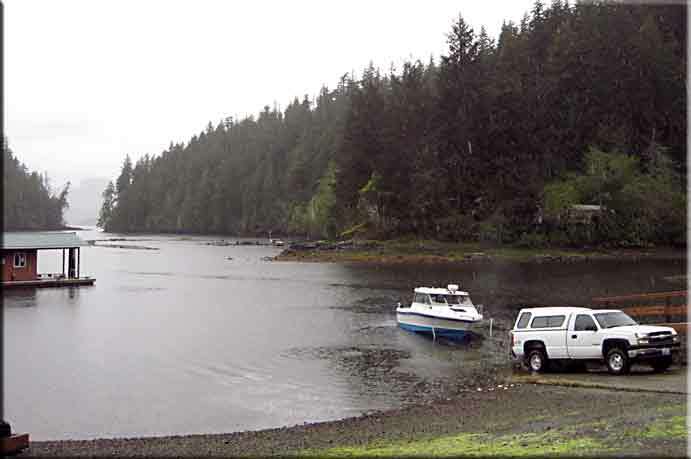 A narrow passage provided admittance from Barkley Sound, and no safer haven for a boater could be imagined. Poett Nook is a well equipped, albeit, utilitarian fish camp. There are 130 campsites and slips for 140 boats. A bunkhouse, with a kitchen, sleeps four to a room in functional comfort. Toilet and showers are in a separate building; bring 1 dollar Canadian coins for the shower. 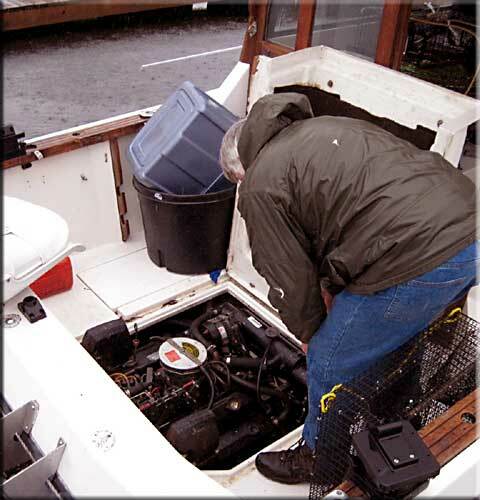 We checked into the bunkhouse at Poett Nook, and immediately began preparations for getting the boats into the water, baiting shrimp pots and loading other necessary supplies. 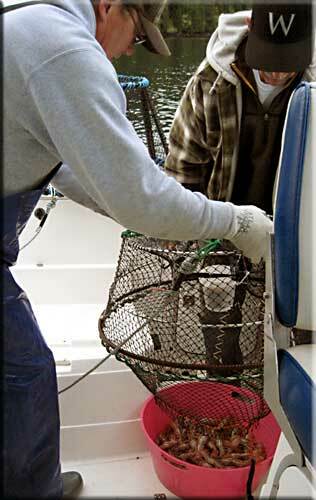 By 7:00 PM, we were motoring out of the bay, heading for a suitable place to put our pots. Suitable meant about 300 foot depth, a reasonably flat bottom, and somewhat protected from strong winds. An hour and a half later, we had pulled our pots, gathered more shrimp than we needed for dinner, and reset them for an overnight soak. Ralph, Doug, Alex, Doug, Kiko. 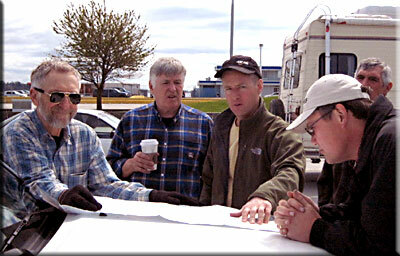 Planning at the Tsawwassen BC Ferry. 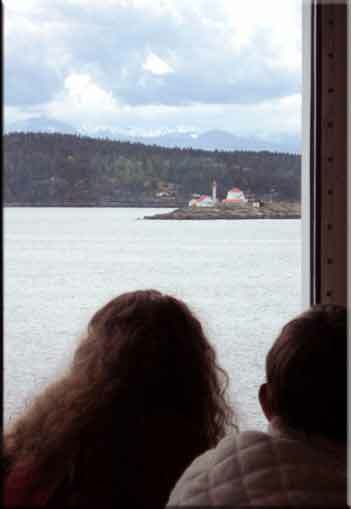 A light house on the approach to Nanaimo. The 25 mile long Alberni Inlet. 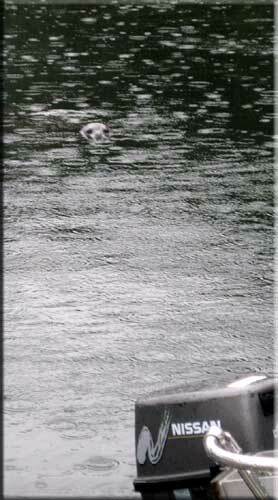 This seal stood continual guard in the marina. Doug getting the engine ready for the weekend. Each ingredient in a shrimp bait cocktail must, firstly, stink. Loading pots, lines, poles in a light drizzle. Looking back at Poett Nook. Doug using the GPS to find the deep spot in the narrow exit. Heading out into Barkley Sound. Looking for a place to drop our pots. 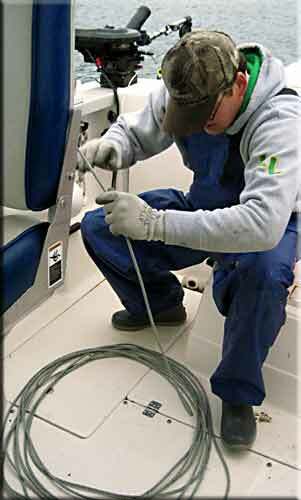 Careful coiling keeps 400' of line untangled. 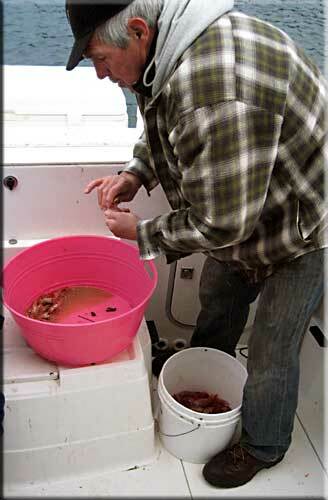 Emptying a catch of spotted prawns. Kiko beheading the prawns; seagulls like this part.